Radio amateurs responded to the ongoing wildfire emergency in California. Earlier this month, ARES volunteers in Amador County supported communications at a Red Cross shelter at the Jackson Rancheria Conference Center, which has been housing evacuees from the Butte wildfire in Northern California. ARES/Auxiliary Communications Service (ACS) volunteers were called out late on September 9. Amador County ARES Emergency Coordinator Daniel Edwards, KJ6WYW, had communications set up at the shelter by midnight and began contacting other ARES members and scheduling operators to work the shelter station 24 hours a day. During the activation, members of Yolo County and Sacramento County ARES spelled the Amador County operators at the shelter. "This gave the Amador County members a break and for some time off to help their neighbors evacuate their positions," Sacramento Valley Section District 3 EC Greg Kruckewitt, KG6SJT, told ARRL. Edwards said 20 operators took part in the activation, with two operators per shift. The station at the shelter was active for 120 hours. 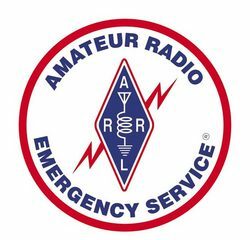 Bill Gustavson, K6BIL, who took part in the Amador County ARES response, said that at one point, with cell phone, Internet, television, and landline down, "my only source of information was ham radio. The radio was the only outside link to the world." He also said he was amazed to learn how many nonhams listen on scanners. As some roads in the area reopened and evacuees were able to return home, Amador County ARES was released from supporting Red Cross shelter communication early on September 14. 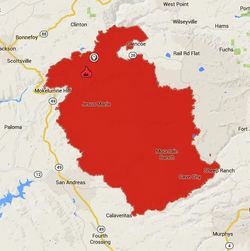 The Butte fire also extended into Calaveras County, in the ARRL San Joaquin Valley Section. "The heart of our county is burned," Calaveras Amateur Radio Society President Ken Sanders, AE6LA, reported, with much of the area under mandatory or advisory evacuation alerts. "We've had an informal net going since the beginning on our 145.170 repeater," he said on September 14, adding that he expected that activity to continue "for several days." The perimeter of the Butte Fire on September 16, 2015. Raging southeast of Sacramento in the Stanislaus National Forest region, the Butte Fire has consumed some 71,000 acres and was 49 percent contained as of September 17. The fire has destroyed more than 250 homes, and damage assessment continues. Meanwhile, the 70,000+ acre Valley Fire west of Sacramento has destroyed nearly 600 homes as well as many other structures. ARRL Sacramento Valley Section Manager Ron Murdock, W6KJ, said Amateur Radio operators coordinated by Charlie Porter, N6JOA, at the University of California-Davis have been collecting veterinary supplies for evacuated domestic animals and livestock. "These will be transported to Petaluma and other unspecified locations in Sonoma County by members of the Class of 2017 Veterinary Sciences Department," he told ARRL. Orlando HamCation® will host the 2016 ARRL National Convention in February. The convention will mark the 70th anniversary of HamCation -- second only in the US to Dayton Hamvention® in terms of attendance. Orlando HamCation is sponsored by the Orlando Amateur Radio Club, an ARRL-affiliated radio club, and is supported by volunteers from radio clubs throughout the region. HamCation has regularly served as the host for the ARRL Southeastern Division Convention, and in 2014 -- the ARRL's centennial -- it was designated as one of the six regional centennial events. HamCation will take place February 12-14 at the Central Florida Fair and Expo Park in Orlando. In 2015, the convention sponsored 28 forums covering topics in Amateur Radio technology, public service, and education. ARRL Volunteer Examiners will conduct morning and afternoon license examination sessions on Saturday. Special event station K1AA will be set up and operating from the fairgrounds, and licensed attendees are invited to participate. The focus of the League's national convention will be ARRL EXPO, which will feature an array of ARRL exhibits and programs. The League also will sponsor several presentations and forums. On Saturday evening, the 2016 ARRL National Convention Banquet will take place at the nearby Highland Manor in Apopka, Florida. Banquet tickets, available from ARRL, are $60, including transportation from the fairgrounds and some nearby hotels. The HamCation website explains how to obtain convention tickets and offers more information about forums, exhibits, exam sessions, and local accommodations -- some offering special convention rates. Convention tickets are $13 in advance or $15 at the gate, offering admission for all 3 days. The fairgrounds can accommodate recreational vehicles within walking distance of the main exhibit buildings. A reservation form is available on the HamCation website. ARRL Volunteer Examiner Coordinator Manager Maria Somma, AB1FM, has been elected as the new vice chair of the National Conference of Volunteer Examiner Coordinators (NCVEC). This marks the first time an ARRL VEC representative will serve in an NCVEC leadership position. She succeeds Michael Maston, N6OPH, of the San Diego County Amateur Radio Council (SANDARC), who resigned as vice chair and as a member of the Question Pool Committee (QPC). The NCVEC called a special election teleconference on September 15 to pick a new vice chair. 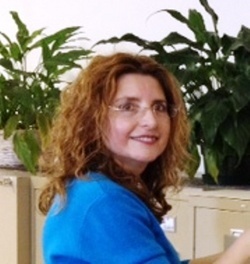 ARRL VEC Manager Maria Somma, AB1FM, is the new NCVEC vice chair. "I am honored to have been elected to this position by the NCVEC organization and excited to serve the 14 VECs and FCC in this capacity," said Somma, who also serves as NCVEC assistant custodian of the rules. No one has been named yet to replace Maston on the QPC. Somma said the QPC will not fill the position immediately, because it is in the middle of the revision cycle for the Amateur Extra class question pool. Larry Pollock, NB5X, of the W5YI VEC is the NCVEC chair, while Michael Cimbala, WK3X, is secretary, and Willard Sitton, W4HZD, is its treasurer. Officers serve 1 year terms, and Somma will serve for the remainder of Maston's term. Officers are elected every July. 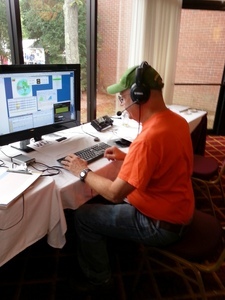 Assistant ARRL VEC Manager Perry Green, WY1O, is a member of the Question Pool Committee. The NCVEC is a private, not-for-profit voluntary association, with membership comprised of the various FCC-certified VECs. The NCVEC functions to facilitate the communication between the FCC and each VEC. When Pope Francis visits the US in late September, Amateur Radio special event stations will take to the air to mark the occasion. The Pope is scheduled to visit the US from September 22 until September 27. Six Papal Visit Amateur Radio special event stations will be active while he is here. 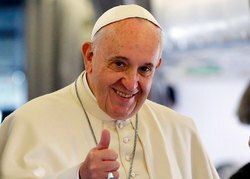 The Pope will arrive on September 22 at Joint Base Andrews and first will visit Washington, DC, then meet with President Barack Obama, and address a joint session of the Congress. On September 25, he will attend a UN General Assembly session and take part in a service at the 9/11 Memorial and Museum at the World Trade Center. The following day, he will speak at Independence Hall in Philadelphia, before concluding his visit with an outdoor mass in front of the Philadelphia Museum of Art on September 27. Call signs from the Washington, DC, area will be K3P and N4P; from New York and New Jersey, K2P; from Southeastern Pennsylvania, W3FRC/WMF, and from Philadelphia, W3P and WM3PEN. Four commemorative QSL cards and a certificate to mark the historic event will be available. Members of the Potomac Valley Radio Club, the Frankford Radio Club, the Great South Bay Amateur Radio Club, and the Holmesburg Amateur Radio Club, plus individual radio amateurs, will help to coordinate activity. A Facebook group has been established for the event. Radio Amateurs in Utah have again made use of a broadband ham radio mesh network to support a public event. Charles Gray, KE6QZU, headed a group of ham radio volunteers that set up a high-speed broadband ham net mesh (BBHN MESH) network in the rugged Wasatch Mountains of northern Utah to provide communication along the final 30 miles of the of the September 11-12 Wasatch 100 Mile Mountain Endurance Race. Other hams covered the first 70 miles of the race using more conventional technology, including FM voice and packet. Brad Rupp, AC7BR (left), and Grant Gardner, KC7HOU, admire their handiwork after setting up a node on rugged Clayton Peak. Using the BBHN MESH system, the hams helped race officials to keep track of the racers and their progress along the extremely difficult course. 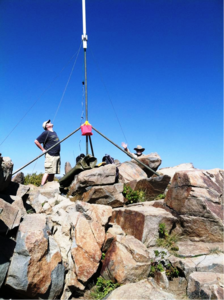 BBHN MESH uses ordinary Wi-Fi technology on Amateur Radio frequencies, which meant the mesh network was able to cover a considerable amount of real estate, even in the challenging mountainous environment. The race course encompassed more than 53,000 feet of elevation change, and it's not unusual for participants to drop out before reaching the finish line. 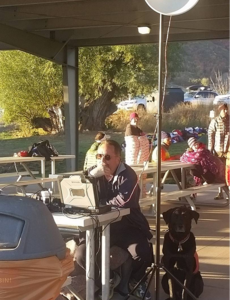 The Reverend Robert Jelf (KG7OHV) manning the Soldier Hollow Race Finish Line Radio/Computer Station with his Service Dog Teal'c. side of the Brighton Ski Resort. The radio amateurs had to work in teams to hoist their radio gear over the rocks to reach the top. The mesh network included five sites, including two unattended relay points. The group employed TeamTalk software for race communication. In addition to Gray, other participants included Brad Rupp, AC7BR; Steven Baxter, K7SRB; Grant Gardner, KC7HOU; David Bauman, KF7MCF; Robert Jelf, KG7OHV; Doug Thompson, W1DUG; Taylor Brinton, KE7BME, and Rich Allen, N7HRA. Special event station W1A at the ARRL New England Division Convention August 21-23 in Boxboro, Massachusetts, was "special" in more than one respect. For starters, it did not have any antennas at the convention site. Instead, the convention hotel served as the control point for "remote base" sites in Vermont, Massachusetts, Manitoba, and even Poland. Dennis Egan, W1UE, and Gerry Hull, W1VE, remote enthusiasts who oversaw the special event, said the fully remote base operation was a first for the W1A special event. Egan, a member of the convention organizing committee, convinced his colleagues to go with the remote option. "We managed slightly more than 1800 QSOs, despite rotten conditions," Hull said. "We were using mainly K2LE/1 in Vermont, and K1TTT in Massachusetts -- both big contest stations." In the past, the New England Division Convention W1A special event station has erected temporary antennas outside the hotel. Hull also reported one "special QSO." ARRL officials spoke with a camper at the Courage Kenny Handiham System's Camp Courage. Directed by Patrick Tice, WA0TDA, Handihams is an organization for radio amateurs with disabilities. W1A enjoyed a successful contact with W0EQO at the camp in Maple Lake, Minnesota. 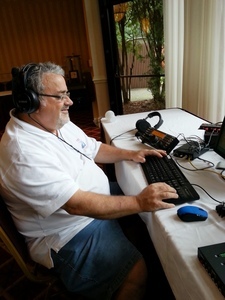 ARRL COO Harold Kramer, WJ1B, extended greetings to the campers on behalf of the League and those at the convention. Camp volunteer Matt Arthur, KA0PQW, operated W0EQO. The Handiham Remote Base HF Stations offer the opportunity for members to operate through a PC or Android device, if they live where they can't have antennas. The initial plan, Hull said, was to contact the camp via VE4EA, taking advantage of daytime propagation between Minnesota and Manitoba. But there was a terrestrial issue: "Cary's [VE4EA] remote uses DSL for Internet, and RF kills the Internet connection on 160-40," Hull explained. "So, instead we used K1TTT, with 4 element 40 meter Yagis at 180 and 60 feet and 1 kW. They were S-5 on the K1TTT end over the remote." Hull said W1A also logged some 50 contacts through VE4EA in suburban Winnipeg. Plans to also use VY1JA's station in Yukon Territory to operate as VY1/W1A fell through, because a solar flare had wiped out the bands in the Arctic region. "There were only two signals on the band -- birdies in the receiver," Hull said. W1A also was able to make a handful of contacts via 3Z9DX in Poland, using RemoteHams, on 40 meters with 100 W and a 3 element Yagi. Operators staffed two W1A operating positions, often with one on SSB, the other on CW. Primary operators were NB1N, WO1N, NF1A, AE5RF/BA4CW), K1BG, N2KW, KM3T, AA4AK, W1QK, W1UE, K1QX, and W1VE. Hull said a lot of younger operators got a chance at the mic. These included KC1CWF, KC1CZQ, and KC1CWX. "It was a lot of fun!" he concluded. Two radio amateurs -- European Space Agency (ESA) astronaut Andreas Mogensen, KG5GCZ, Soyuz commander and Russian cosmonaut Gennady Padalka, RN3DT -- plus Kazakh cosmonaut Aidyn Aimbetov, arrived back on Earth on September 12 from the International Space Station (ISS). Mogensen, Aimbetov, and cosmonaut Sergey Volkov, RU3DIS, had launched in a Soyuz transporter to the ISS on September 2 from Baikonur cosmodrome. Aimbetov -- who had replaced "space tourist" and British singer Sarah Brightman on the Soyuz flight -- and Mogensen took part in the 10-day ESA mission to test new technologies and conduct a series of scientific experiments. 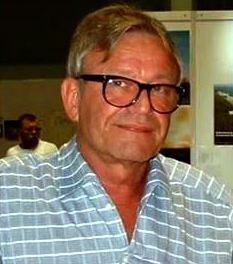 Mogensen is Denmark's first astronaut, while Aimbetov is the first Kazakh cosmonaut. 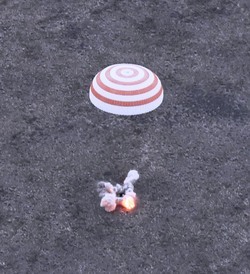 The trio undocked from the orbiting complex on September 11 in the Soyuz spacecraft that had been attached to the ISS, leaving the vessel they arrived in for the station crew. The new Soyuz spacecraft will return NASA astronaut Scott Kelly and cosmonaut Mikhail Kornienko, RN3BF, at the end of their one-year mission next March, along with Volkov. The return wrapped up 168 days in space for Padalka, who had been on the ISS since March and has logged a record 879 days in space on five flights -- more than 2 months longer than cosmonaut Sergei Krikalev, U5MIR, the previous record holder. The undocking of the returning Soyuz marked the formal start of ISS Expedition 45 under Kelly's command. In addition to Kelly, Kornienko, and Volkov, those onboard the ISS include astronaut Kjell Lindgren, KO5MOS; cosmonaut Oleg Kononenko, RN3DX, and JAXA astronaut Kimiya Yui, KG5BPH. Three more radio amateurs are scheduled to head to the ISS in December. They are cosmonaut Yuri Malenchenko, RK3DUP; UK astronaut Timothy Peake, KG5BVI, and Timothy Kopra, KE5UDN. The September edition of the IARU Region 1 Monitoring System (IARUMS) newsletter has reported that Russian Military traffic in the Amateur Radio 7 and 14 MHz bands increased during August. At least some of these intruders were likely to be audible in other parts of the world. Monitors in Europe reported a Russian over-the-horizon (OTH) radar in Gorodezh on 14.108 MHz, causing strong interference daily and often exhibiting splatter. In addition the Russian Navy was reported active frequently on 14.192.0 MHz using FM CW. Other monitoring stations in Germany reported numerous Chinese OTH radars in other bands, including on 75 meters. Veteran IARUMS Region 1 intruder watcher Wolf Hadel, DK2OM. Region 1 IARUMS Coordinator and veteran monitor Wolf Hadel, DK2OM, recently told the Rusk County Amateur Radio Club in East Texas that some of the worst offenders are OTH facilities in Russia and Iran. The signals can result in broad swaths of noise in the 20 meter band, he said. During his VoIP talk, Hadel pointed out that recruiting volunteer monitors with the "right equipment" is difficult, and he encouraged club members to join the hunt for ham band intruders. According to Region 1 monitors, intruding signals said to be coming from Spanish fishing vessels have now been reported on all amateur bands -- shared and exclusive. A beacon, reported to be in Kazakhstan, has been transmitting "V" on 7027.5 kHz continuously. Apparent North Korean diplomatic traffic from the DPRK embassy in Moscow has been heard on 14.109.5 MHz. Mario Taeubel, DG0JBJ, observed 31 OTH radars on 20 meters, 28 OTH radars on 15 meters, and 11 OTH radars on 10 meters during August. In addition, a Chinese OTH radar has often appeared on 80 meters in IARU Region 3. Monitors in Europe also have monitored transmissions between taxi drivers and dispatchers on Amateur Radio frequencies, primarily on 10 meters. The ARRL recently forwarded reports from IARU Region 2 and Hawaii to R2 Monitoring System Coordinator Jorge Del Valle, TG9ADV. These included so-called drift net beacons on 10 meters (28.281 and 28.226 MHz), as well as digital, radar, and phone intruders heard on 20 meters in Hawaii. Authorized by the IARU Administrative Council, IARU Monitoring System volunteers work under the guidance of the IARU International Monitoring System Coordinator and regional coordinators. The IARU Monitoring System operations are coordinated under the Monitoring System Committee. 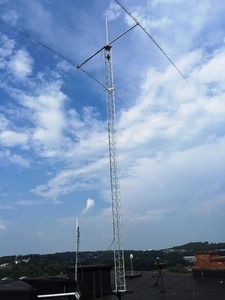 The new fall semester at Worcester Polytechnic Institute (WPI) in Worcester, Massachusetts, heralded not only the resumption of classes but a new antenna tower for the WPI Wireless Association (WPIWA), the home of W1YK. The new tower replaced an older one atop the four-story Salisbury Labs building on the campus, where the club's other antennas are located. The club station has long been housed in a small penthouse on the building. The new tower sports a 2 element antenna to cover 40 and 10 meters. The new WPIWA tower supports a 40/10 meter Yagi. WPIWA President Andrew Mahn, NS1A -- a member of the Class of 2017 who is studying management information systems -- credited many people for helping make the project possible, including the club's current and previous executive boards, the WPI Student Government Association, and many WPI employees who worked with club over the past several months to coordinate the new tower installation. He singled out club alumnus Gregory Karp-Neufeld, W6GKN, as essential to the project from the very beginning, and who contributed countless hours to it throughout the summer from the West Coast. The WPI Wireless Association traces its roots to the earliest days of Amateur Radio. The group was first founded in October of 1909, by Oliver B. Jacobs and a group of 40 others, inspired by a similar initiative at the Massachusetts Institute of Technology. 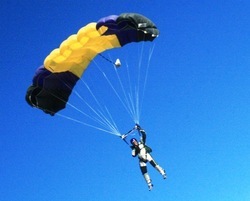 More photos are on the club's Facebook page. Ned Stearns, AA7A, Now Maintaining World Above 50 MHz Standings: Ned Stearns, AA7A, now is maintaining The World Above 50 MHz Standings on the ARRL website. 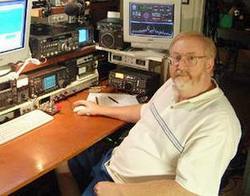 Stearns has chased DX on all bands, operated as part of DXpeditions all over the world, and run moonbounce from home and abroad. He is active on all bands from 160 meters through 23 centimeters. The World Above 50 MHz Standings page is a listing of station operator-reported information detailing the number of grids, states and DXCC entities worked on 50 MHz and above. This information is reported by the station operator and does not reflect data confirmed by the ARRL Awards Branch. The ARRL will verify the veracity of exceptional claims. Numbers reported should reflect confirmed contacts. Report information to standings@arrl.org. Visit The World Above 50 MHz Standings webpage. Early Registration for ARRL/TAPR Digital Communications Conference Ends September 19: Early conference registration closes on September 19 for those planning to attend the 34th annual ARRL/TAPR Digital Communications Conference (DCC). The 2015 DCC will take place October 9-11 near Chicago. The DCC provides an international forum for radio amateurs to meet, publish their work, and present new ideas and techniques. Presenters and attendees will have the opportunity to exchange ideas and learn about recent hardware and software advances, theories, experimental results, and practical applications. Fox-1C and Fox-1D FM Transponder CubeSats to Share a Ride: In response to a breaking opportunity, AMSAT and Spaceflight, Inc have arranged for two of the Fox series of CubeSats -- Fox-1D and Fox-1C -- to share a ride into space. Fox-1D will accompany Fox-1C on the maiden flight of the SHERPA system on a SpaceX Falcon 9 vehicle. Fox-1D is identical to Fox-1C, but operates on different frequencies and carries the University of Iowa HERCI (High-Energy Radiation CubeSat Instrument) radiation-mapping experiment as a hosted payload. Once in orbit, Fox-1D will provide additional selectable U/V or L/V repeater capabilities and will be able to downlink Earth images from the Virginia Tech camera experiment. Launch is currently planned for the first quarter of 2016. AMSAT has said its Fox-1A and Fox-1B CubeSats will go aloft as part of the NASA Educational Launch of Nanosatellites (ELaNa) program, which offers free launches to educational entities and encourages science missions. Fox-1A is scheduled to launch this fall. For more information on the Fox satellites, see "Fox-1, the New Era of Amateur Radio Satellites," by Dave Jordan, AA4KN, in the July 2015 QST. Tad Cook, K7RA, Seattle, reports: Solar activity is perking up this week. Average daily solar flux rose from 85.3 last week to 97.3 for the reporting week, September 10-16. Over the same 2 weeks, average daily sunspot numbers rose from 37.3 to 66.9. The latest forecast from USAF/NOAA shows solar flux at 110 on September 17-19; 105 on September 20-22; 100 on September 23; 90 on September 24-26; then 85, 80, and 85 on September 27-29; 90, 95, and 90 on September 30-October 2; 85 on October 3-6; 90 and 95 on October 7-8; 100 on October 9-10; 105 on October 11-12; 100 and 95 on October 13-14, and 90 on October 15-23. Predicted planetary A index is 8 on September 17-19; 12 on September 20; 10 on September 21; 8 on September 22-23; then 15 and 10 on September 24-25; 5 on September 26-29; 8 and 18 on September 30-October 1; then 25, 20, and 12 on October 2-3; 25, 20, 18, and 12 on October 4-7; 18, 15, 10, 12, 20, and 12 on October 8-13, and 8 on October 14-15.